CASTLE ROCK, Wash. – Western Washington’s ability to grow rich, healthy pasture makes it an ideal location for growers wishing to take advantage of rising consumer demand for sustainably raised meat. Day-long courses about sustainable beef, pork, poultry, lamb and goat production will be offered Friday and Saturday, April 4 and 5, at Castle Rock High School and Kitsap County Fairgrounds by Washington State University Extension and the Department of Animal Sciences. Beef 100, Lamb/Goat 100 or Poultry 100 may be taken at Castle Rock Friday and Pork 100 or a reprise of Poultry 100 will be at the fairgrounds Saturday. A new addition to the short courses is Youth Livestock 100 on Saturday at the fairgrounds. Focused on young livestock producers, it will cover all aspects of production with an emphasis on meeting quality assurance standards. Early bird registration – paid by March 28 – costs $65 per person, $50 for two or more from the same farm and $20 for Youth Livestock 100. Discounted registration allows attendance in multiple/same courses when registering two or more from the same farm. 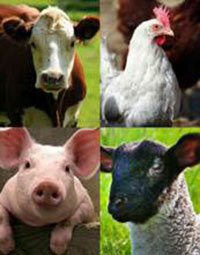 After March 28, the fee is $75 per person per course or $25 for Youth Livestock 100. Registration includes lunch, materials and a flash drive full of livestock resources to take home. Register online at http://Livestock100.BrownPaperTickets.com or download the form, which includes detailed agendas for each course, at http://tinyurl.com/Livestock100 and mail with your check. Courses are designed to increase the knowledge and skills of those expanding into livestock production, and they are also excellent refreshers for experienced producers looking to increase the sustainability of their operations. Topics address opportunities and issues that enhance the production, safety and quality of meat from farm to table. Presenters include WSU Extension meat and livestock specialists with extensive knowledge in all aspects of livestock production. From genetic selection, reproduction and life cycle nutrition to pasture management, marketing and animal evaluation, attendees will learn what it takes to produce and maintain high quality livestock. For more information on the WSU Extension Livestock 100 short courses, contact Jan Busboom, WSU Meat Specialist, 509-335-2880 or busboom@wsu.edu, or Sarah M. Smith, Area Animal Science Educator, 509-754-2011, x413 or smithsm@wsu.edu.